With recession fizzling out after its catastrophic spell on the world economy following the collapse of Wall Street, experts across the globe are introspecting over the scarred remains of the global financial system. Barring a few prescient financial sages, majority of the lesser mortals have realized the futility of their beliefs only after enduring through the most painful part of the financial karmic cycle, the bust. For the uninitiated, here is how the financial karmic cycle works. Financial stability creates confidence in the minds of the investors. With air filled with optimism, they begin to take risks. They place unshakeable faith in the markets in such euphoric times. Walter Bagehot, Editor of the Economist during the twentieth century, puts it succinctly. “All people are most credulous when they are most happy”. Optimism soon turns farcical, descending towards recklessness. In the end, it turns sinister, leading to the bust. Fragile institutions built over it collapse. After purging the market of its excesses, financial stability resurfaces and the cycle continues. Is it possible to liberate the world economy from these vicious karmic cycles? Can there be a financial nirvana? These questions might sound like a philosopher’s rant with pressing problems in fiscal management and what not. However, looking at the way the medication of the crisis is taking us irrevocably towards it again, it is important to introspect and revisit several fundamental levers which manage the world economy. This would help us to establish the ambitious, “new world order” effectively. The concept of risk needs to be demystified in simple terms, devoid of the baggage carried by mathematical models. These mathematical models, borne from academia acquire different dimensions altogether whenever they are transported to the real world. The assumptions holding those models become more potent. This basic misunderstanding has had devastating consequences for the world economy. For instance, the popular Value at Risk Model assumes that the volatility of the asset prices and their correlation of the prices remain constant. This is a dangerous assumption laden with far reaching implications in assessing the original value of risk. Add this with the basic human fallacy which equates recent trends with future. A perfect recipe for disaster is created. Managers of the “new world” have tremendous responsibility to weigh the risk accurately rather than pushing them aside. It is equally pertinent to understand the concept of innovation, especially in this globalization age. Although innovations have been the survival mantra during difficult times, they can also be an albatross around the neck when they tend to complicate things and make us naively believe in their sophistication. Several financial products which were built on mind boggling mathematical models stupefied the common investors and regulators alike. Globalization, with its present avatar, has brought the chaos theory to life in our everyday lives where the actions of a banker in one corner of the world affects our day to day lives. Innovation should strive to simplify this highly networked world created by globalization. This would equip us with the much sought commonsense to confront the challenges of the globalized world. 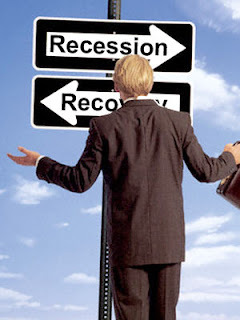 Recession, in a broader sense, is similar to the pralaya metaphor of the Hindu mythology. Pralaya signifies dissolution and cosmic flood, with its ambit expanding far beyond Joseph Schumpeter’s creative destruction. Creative destruction refers to a revolutionary idea destroying an old idea, changing the rules of the game, whereas Pralaya decimates the playing field and we are let with no option but to start the game afresh. Every Yuga (unit of cosmological time, equivalent to 1000 years) comes to an end with a pralaya signifying the end of the most cherished philosophies of the times. Just like the early nineties busted the bubble of communism with its utopian ideas of equality, 2008 has laid bare the flaws of capitalism. The ongoing recession has brought to end the Greed Yuga which deified greed as the panacea for poverty and other ills of the world. Greed is no longer good. Experts of the West who had derided savings as an essential trait of the conservative east have begun to extol the virtues of savings. Alan Greenspan, former Federal bank chairman of US, who once condescendingly wrote that “only insecure people of developing nations….need to save”, in his book The Age of Turbulence, has admitted that he was wrong in his presumptions, looking at the “once in a century” financial crisis. Several investment gurus and eminent journalists have begun to question the ludicrous logic of borrowing to spend. It’s true that consumption spurs growth by increasing demand. However, isn’t it too obvious to note that consumption needs to be balanced by adequate savings? It will be sagacious on our part to look at this recession as an essential pralaya that was bound to happen to break the crutches we placed on the ‘irrational exuberance’ of the markets. Something drastic, beyond the shores of imagination, had to occur to break the arrogant egos and confront our fears long forgotten in euphoria. This pralaya perspective although might not compensate the common investors who have lost their wealth in the market meltdown, will definitely stop the nasty blame game that is happening in the media circles across the world. It’s indeed shameful to see ugly accusations being made on the reputation of the economics profession as a whole without proper understanding of the fundamentals. We need not be so apologetic about this recession as long as we learn the lessons taught by them and understand the new reality we are living in. At the foremost, we need to re-evaluate our priorities towards finance in our economy. Finance should not be the prime mover of the economy. Entrepreneurs, the original risk taker, engineers, scholars rather than bankers, should be the helmsmen of the economy. Finance should return to its original duty of managing the checks and balances of the economy. They however should be understood by everyone. Finance is too costly a subject to be left understood by bean counters, investment bankers and economists alone. Financial education should begin right from the day we put pocket money in piggy banks. Ignorance can never be an excuse for any disaster, no matter what. I would be living in utopia if I were to assume that recession would never occur in the “new world”, with the vast expanse of information that is being disseminated across the world through summits, documentaries, et al. We will do mistakes again, although not in the immediate future. I earnestly hope that we don’t make the same mistakes again (although history has several contrary evidences to offer). New bubbles will be created, burst and there are chances that we might have to be awakened again with another pralaya. My spiritual guru’s words, “Pain is inevitable. Suffering is optional.” resonates well for markets and individuals alike. Rather than hoping against hope that such cataclysmic events will never occur, it will be wise to look at how we are going to respond towards them. I am optimistic enough to believe that with proper sadhana (read as prudent financial actions) and commonsense wisdom, financial nirvana isn’t difficult to achieve. Recessions will continue till the oligarchy of central banks around the world and the Federal reserve keeps operating with impunity.